A few years ago, I took an interest in the history of the Progressive Era. This interest was peaked by conservative author Jonah Goldberg’s polemic Liberal Fascism and moved to more academic research during my undergrad. I studied the history the labor unions and the words and ideas of major progressive icons. One scholar whose work I came into contact with and continued to follow over the years was Princeton economist Thomas Leonard. 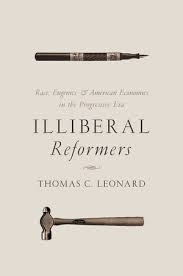 I’ve known for the last few years that Leonard was working on a book that explored the relationship between progressive reformers’ economic agendas and their enthusiastic support of eugenics. Finally, his Illiberal Reformers: Race, Eugenics, and American Economics in the Progressive Era was published this year through Princeton University Press. The book meticulously demonstrates that the progressive impulse toward inflating the administrative state was driven largely by self-promotion (i.e, the professionalization of economists), racist ideologies (i.e., the fear of race suicide),1 and an unwavering faith in science. Not only should the “undesirables” of the gene pool be sterilized, but they should be crowded out of the labor force as well. Those considered “unfit” for the labor market included blacks, immigrants, and women. In order to artificially raise the cost of employing the “unfit,” progressives sought to implement minimum wage (often argued to be a “tariff” on immigrant labor), maximum hours, and working standard legislation. There is far more in Leonard’s book, which not only provides keen insights into progressive economics, but provides an excellent historical overview of race and eugenics in the Progressive Era. Check out his interview on the podcast Free Thoughts below. Even seemingly good things like national parks had racist overtones.